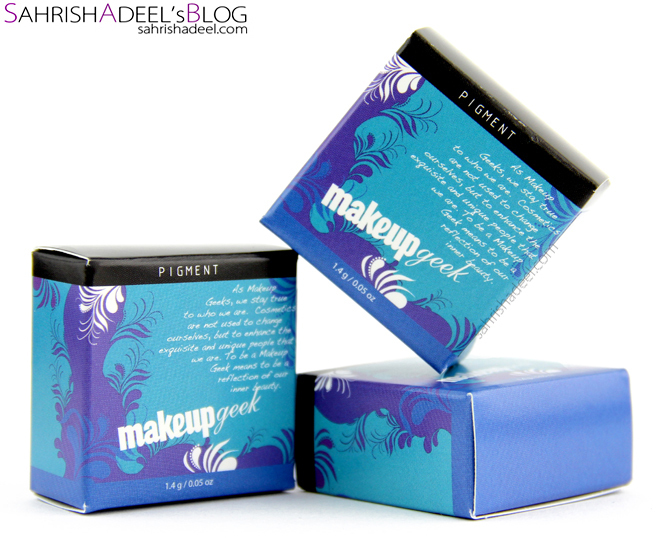 Makeup Geek Pigments - Review & Swatches | Sahrish Adeel - Malaysia based Pakistani Beauty & Lifestyle Blogger! A couple of weeks ago I was thinking about trying some really unique pigments since I haven't been using much lately and right in time, Makeup Geek came up with some really exciting shades. - Jars are rated for 1.5 grams of product weight (which is required listing for jar and box), but the jars actually contain about 2 full grams of product. 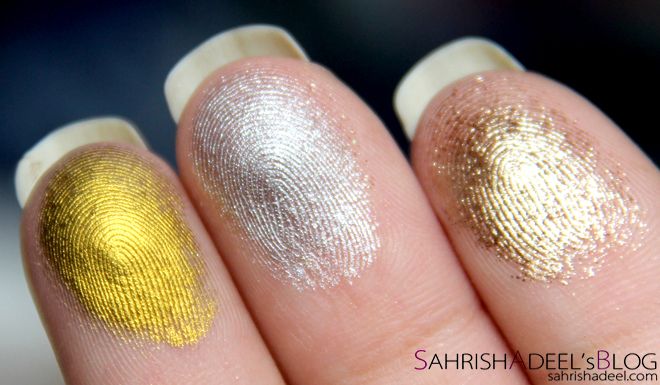 Pigments have a versatile personality and can be used in so many different ways. You can use them on eyes, face, body, lips and nails. These pigments come in plastic transparent jars with black plastic screw lid. They do not have sifters. Jars are labelled at the back with names and quantity details. Label says that each jar contains 1.4 grams of product while it actually has 2 grams of product. Utopia is a shimmery brown shade. It is just the perfect brown shimmer shade that has a dull gold tone without going towards typical bronze tone. This looks chunky but has a very fine texture. This shade has a cool feel to it. Prince Charming is a silver shade. Same as Liquid Gold, this can also be swept lightly to have a silver highlighted finish or built up to full pigmentation. This one also has an extremely fine and silky texture and has a grey undertone. This shade has a cool feel to it. Liquid Gold is a metallic golden shade which can be swiped really lightly to have a golden highlighted finish or built up to achieve the true metallic gold finish. It has a very smooth and fine texture. This shade has a warm feel to it. These swatches have been taken over Makeup Academy's Professional Eye Primer and only the tiniest product has been used. In top part of the first picture you can see the pigments at their fullest pigmentation. Look how chunky Utopia looks. In bottom part of the first picture you can see all three shades swiped really lightly. Like sometimes we swipe a certain shade all across the lid for a sheer coverage. I am so loving Liquid Gold & Utopia in this one. Second picture is just for people who are into looking at the swatches by using fingers only. =D Oh yeah, I got you all covered here. If you have read my review on Makeup Geek Eye Shadows, you would know how much I appreciate Marlena's efforts to provide highly pigmented eye shadows which are really affordable. This time, she came up with ten gorgeous pigments. I picked three of those to try and I must say I am flattered with the pigmentation for these as well. All of these are highly pigmented and goes onto the lids pretty smoothly Since they are loose pigments, one cannot complain about fall outs until or unless used in really tiny amount and applied super carefully. Quick Tip: Use pigments using a wet brush to have minimum fall outs or if you prefer to use dry brush with pigments like I do, tap off the access product and apply them over an eye primer or eye shadow base so they will stick. Plus, always stay on the safe side and do rest of the makeup after you are done using pigments on your eyes. Without an eye primer, they go onto the lids just fine but start to crease in about thirty minutes. They start to tone down in about one-two hours and by the end of fourth hour, they were almost gone. Plus, since I used them for full coverage, I noticed fall outs later in the day even after I cleaned up under the eyes. With an eye primer, they go onto the lids just fine but I can visibly see how beautiful they stick to the lids resulting in less fall outs during application. They did not crease or toned down for over six hours (had to take a shower after that) and I believe that they will stay onto my eyes for over eight good hours. Plus, I did not notice any fall out later in the day. The negative point I noticed was having these pigments in jars without sifters. I know most of the companies have pigments without sifter but since I expect Marlena to have user friendly creations, I think there should be a sifter for these jars with a big hole in the middle. It will save the product while making it mess free. 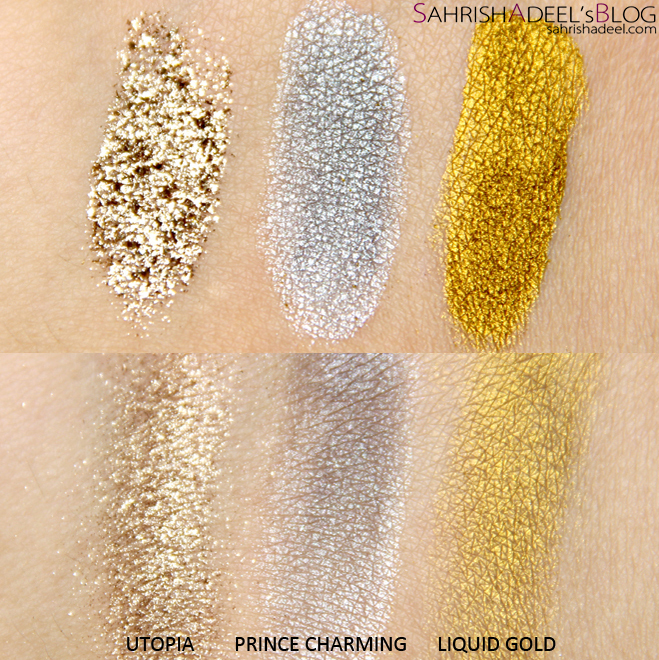 Overall, I am loving these pigments and I think they are a big addition in Makeup Geek's range. My personal favorite out of these three is Utopia, I LOVE IT. Formula, texture and staying time is great for all three of these. I hope to see more shades specially mattes in this range in coming future. Each Makeup Geek Pigments costs $6.99 and can be bought online from Makeup Geek's website. They ship worldwide at affordable rates. Have you tried these pigments yet? Which one is your favorite shade out of these three?